He'll need a big wrist for this watch! This attention getting watch is large enough to attract the attention it deserves. The blue face of the watch is actually a little lighter than pictured here, but otherwise what you see is what you get. 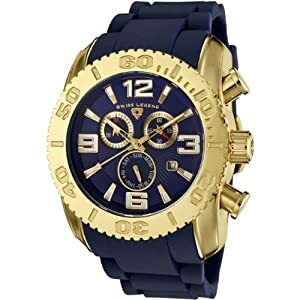 Blue face, gold accents and a blue rubber watch band complete this flashy but functional look. It uses a Swiss quartz movement to keep precise time. Water resistant to 330 feet (100 meters), and features a unidirectional rotating bezel for diving, with extra markings for the "red zone". This is a quality watch at a reasonable price.